This month I attended both a wedding and a funeral. 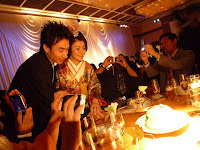 My friend/student got married at a posh hotel near Tokyo Disneyland. As the guests entered the ballroom, both the bride & groom and their parents formed a greeting line. At this time, the bride wore an all-white silk wedding kimono. This dates back to the Edo era and the traditions of the brides of the samurai. Soon after she changed into a very colorful ornate gold, silver and red kimono. This was decorated with cranes and flowers and other auspicious symbols. Finally, she wore a white wedding gown. 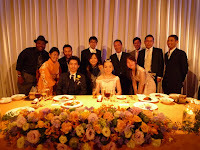 During the time when the bride was changing, the guests enjoyed a delicious full-course Chinese meal. 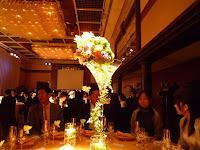 Japanese wedding receptions don't have dancing as we do at many receptions in the states but members from the bride's flamenco group performed for us and a professional opera singer (bride's friend) also sang a most beautiful song. One big difference between wedding customs in Japan and America is the gifts that guests bring. In Japan, new notes (to signify a new start in their lives) are put into a fancy envelope (shugi-bukuro). The usual amount is 30,000 yen (over $300). There is no wedding registry or gift list, and guests do not bring store-bought gifts. In comparison, guests usually bring a non-monetary gift worth on average between from $50-$100 in America. Oh yeah, and you never bring a guest to a Japanese wedding (as it's common practice for a husband to bring wife or boyfriend to bring girlfriend, etc. in America). Our neighbor, a very nice and cool gentleman suddenly passed away. We live in the same apartment building and also go to his hair salon. Testimony to what a good man he was, more than 2000 people attended his wake/funeral. Japanese funerals (soshiki) are usually (90%) Buddhist ceremonies. As guests pay their last respects, a Buddhist priest (or two) will chant a section from a sutra. 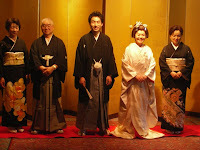 Men wear black suits with black ties and women wear a black dress or black kimono. 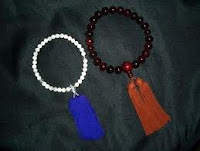 Most people car ry a set of prayer beeds called "juzu". As the priests are chanting, guests go to front where the family members are seated and bow, offer incense three times to the incense urn and then bow again in front of the deceased. The deceased is usually given a new Buddhist name (kaimyo) written in old "kanji" (Chinese characters) that few people nowadays can read. After the funeral, 99% of all deceased Japanese are cremated. This became common after World War 2 due to its efficiency and cleanliness. Also some local governments ban burials. A cremation takes about two hours. Family members return when cremation has been completed. They then pick the bones out of the ashes and transfer them to an urn using large chopsticks. This is the only time in Japan when it is proper for two people to hold the same item at the same time with chopsticks. This is a major social faux pas if done at any other time. A funeral in Japan is one of the most expensive in the world. The complete cost including buying a plot averages over 2 million yen (around $25,000). This is one reason guests bring condolence money called "koden". This is given in a black and white decorated envelope. The usual amount is around 5000 - 10,000 yen. Guests are also given a small gift (usually tea or sugar) as they go. At funerals in America, there is always a eulogy given by the priest and a family member or good friend of the deceased. Japan doesn't have this custom. Note: Pictures of funeral are all taken from internet.